China has made great contributions in supporting African countries in their development, and helped reduce poverty around the world, thanks to the development cooperation policies of China with countries in the developing world, said UN Secretary-General Antonio Guterres in an exclusive interview with China.org.cn on Monday. Guterres said China's investment in other countries could be integrated with their own development processes. "It's very important to support African countries to fully benefit from China's cooperation, and to fully integrate it into their own development programs." "China's cooperation is an important contribution to reduce poverty around the world, and to achieve other development goals, and at the same time to create synergies that will allow, through international cooperation, the global economy to be more prosperous and to bring more benefits to the global population," he added. Guterres also pointed out that China has been able to move hundreds of millions of people out of poverty, and the country now has a very clear target to fully eradicate extreme poverty in China by 2020. This is China's most important contribution to the world. "These two contributions together represent China's very important commitment and contribution to the implementation of the Agenda 2030, the Sustainable Development Agenda and its goals," he said. 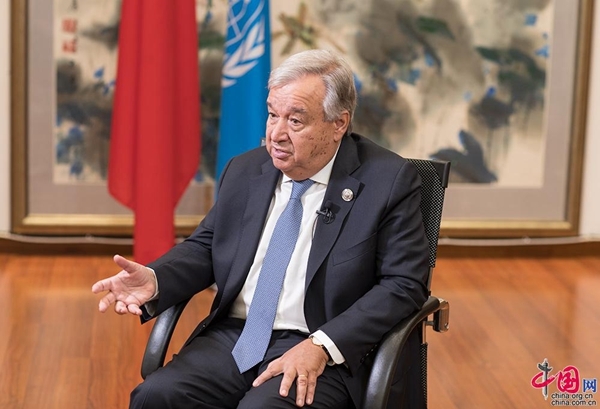 Guterres believes that China will achieve its goals because they have strong commitments from Chinese President Xi Jinping, the Chinese government, and the society. He estimates that after 2020, China will continue its systematic program to reduce less extreme poverty that might still exist, and will aim to create a society in which the fight against inequality and the capacity to bring all people into the benefits of the modern era will be achieved. Guterres was invited to attend the 2018 Beijing Summit of the Forum on China-Africa Cooperation (FOCAC) held on Sept. 3-4.